The events were sponsored by Ministry of Culture, Govt. of India Vancouver: As part of Komagata Maru centennial celebrations, a commemorative dinner sponsored by Ministry of Culture, Government of India was held at Fairmont Hotel Vancouver on May 28th. The Consul General of India in Vancouver Mr. Ravi Shankar Aisola presided over the evening where the descendants of Komagata Maru passengers & people involved in the narrative of Komagata Maru were honored. One of the main organizers for the event, Harbhajan Gill, President of Komagata Maru Heritage Foundation gave a very emotional speech. Tony Singh, Daljit Thind, members of Khalsa Diwan Society, political and social leaders, Jinny Sims (MP-NDP), Ujjal Dosanjh (Former BC Premier), Raj Chohan and Harry Bains, both MLAs NDP, Dave Hayer (Former MLA), Wally Oppal (Former Attorney General of BC), Aditya Tawatia (President OFBJP), Parveen Goel (VP OFBJP) and Vivek Savkur (General Secretary OFBJP), Sukhi Bath of Sukhi Bath Sewa Club were present among the many prominent personalities. Consul General Mr. Ravi Shankar captured the essence of evening in his speech by reminding everyone to work for the equality and unity, the ideals for which our ancestors fought. 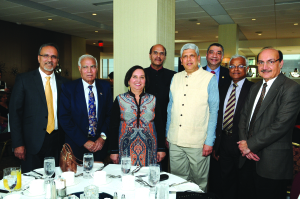 He pointed out that Komagata Maru event had a significant impact the Indian freedom struggle. Many speakers reminded everyone not to forget the sacrifices that South Asian pioneers have made and how selflessly everyone in our community acted to help all the Komagata Maru passengers. We have come a long ways in last 100 years however work is not done; there are still inequalities and discrimination that need to be opposed and eliminated. The MC for the event was Naveen Girn and many pioneer families attended the function. Speaking with Lucky Randhawa of SW Media Group – Asian Journal, Aditya Tawatia OfBJP President said, “This is great event to be part of. This is our heritage and we should always try to nurture it for future generations”.